Pancakes, though delicious, are traditionally pretty much devoid of nutrients, and thus rarely make an appearance at my breakfast table. White flour, white rice, white sugar, even white potatoes don’t really stand a chance in my kitchen. 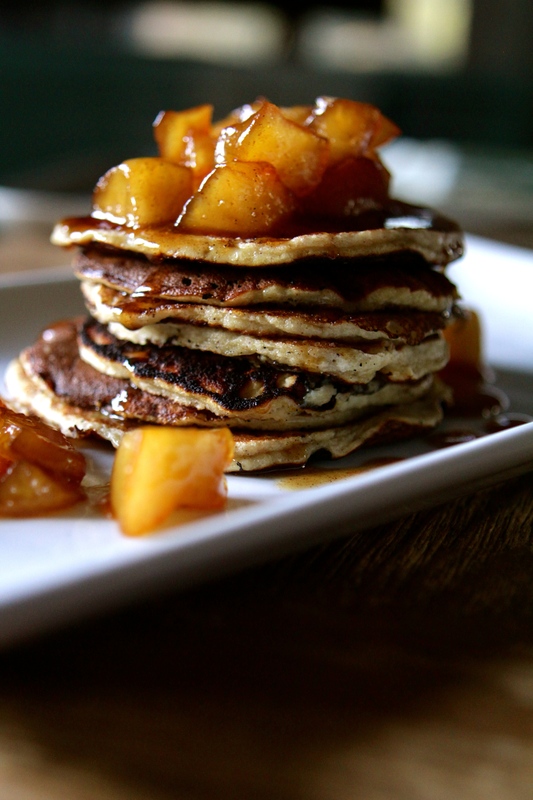 Even the whole grain varieties of pancakes are lacking substantial protein, essential to a good breakfast. These pancakes are a super yum way to add more protein to your breakfast, while still satisfying a pancake craving. They are grain free and made with almond meal, apple sauce and protein powder. I cooked them in grass fed ghee to give them a little extra healthy fat boost, then topped them with caramelized apples and local honey. Whisk the eggs in a small bowl, then add the applesauce, maple syrup, vanilla and cinnamon. Add in the almond flour, protein powder and baking powder and mix until thoroughly combined. Heat a cast iron skillet over medium. Add a small amount of butter or coconut oil . Once heated, pour in about 3-4 Tablespoons of batter. Cook 2-3 minutes per side, turning once bubbles start to form and the pancakes are firm enough to be flipped. Please note, these pancakes are a little more delicate than normal pancakes, so be careful when flipping! Repeat with the remaining batter. In a small saucepan, combine the apples, butter, maple syrup or honey, lemon juice and cinnamon. Heat over medium heat until bubbling, then lower the heat and cook 10-15 minutes until apples soften and liquid thickens. Pour over pancakes and serve hot!